Hackolade includes the ability to maintain both a ‘business name’ and a ‘technical name’ for objects (containers, entities, and attributes.) To facilitate the maintenance of these 2 names, it is possible to keep them synchronized and transformed based on a set of user-driven parameters, and optionally based on a conversion file maintained outside of the application. Name conversion can go both directions: Business-to-Technical, or Technical-to-Business. Furthermore, when performing reverse-engineering, it is assumed that the database instance contains technical names, to be transformed in business names. 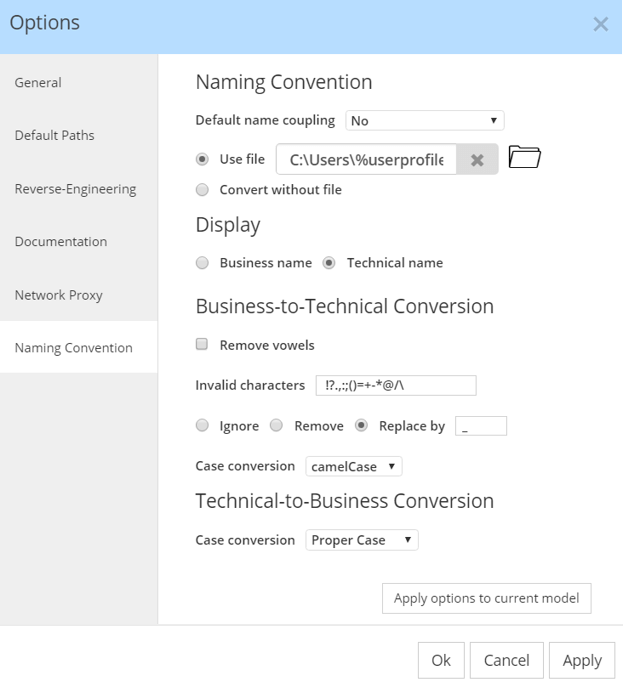 If you do not wish to use this feature, keep disabled the Name Coupling parameter (see below) and simply leave the technical name property blank, so the (business) name property is used by default. A conversion file is not mandatory to use the Naming Conventions feature. A conversion file is a .csv file listing words that may appear in object names (business name), with a corresponding technical name to use instead in database definition scripts. The conversion file is made of at least 2 columns, with Business name as a first column, and Technical name as the second column. Additional columns are ignored by Hackolade. The columns are separated by commas. The first line is the header line, and is ignored in the conversion. The lines are separated by a <CR><LF>. There is no limit to the number of lines in the file. The values in the columns are not case-sensitive. A case conversion may be applied in the conversion parameters, cfr below. Enable auto-complete: when this option is enabled, auto-completion is active to use the conversion file to type-ahead names as they are created. 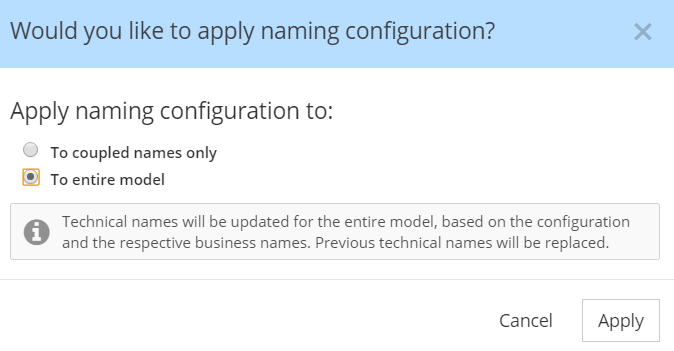 Default name coupling: 3 options are available from the dropdown box: No, Business-to-Technical, or Technical-to-Business. Invalid characters: the characters declared can optionally be removed or replaced by another character. Example of invalid characters: " ! ?.,:;()=+-*@/\" (note the space in first position), and replacing character: "_"
snake_case: all letters are converted to lowercase, plus words are separated with a underscore "_"
kebab-case: all letters are converted to lowercase, plus words are separated with a dash "-"
dot.case: all letters are converted to lowercase, plus words are separated with a dot "." path/case: all letters are converted to lowercase, plus words are separated with a slash "/"
Upon exit of the dialog (via OK or Apply) after making a change in parameters, the user will be prompted to choose whether: to apply the changes to just previously coupled names, to apply the changes to all object names, or to not apply any of the changes performed by canceling the dialog. In the properties pane, the relationship between business name and technical name can have 3 states: OFF (default), convert Business name to Technical name, or convert technical name to business name. This state can be set separately for each individual object. 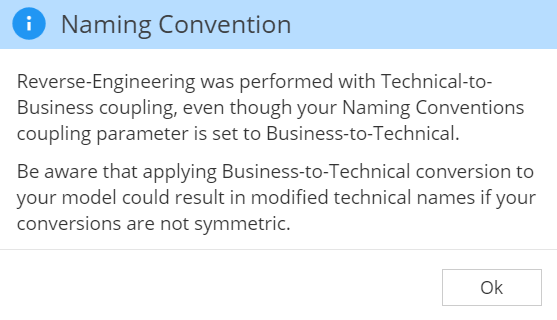 To set Naming Conventions to control the business names and technical names of all objects, select Tools > Options > Naming Conventions, then choose either Business-to-Technical or Technical-to-Business from the dropdown "Enable name coupling". To indicate that coupling is OFF between business and technical name, the 2 = sign icons to the right are un-selected. The user could simply type the technical name of his choice, without any compliance to the glossary file. where the = sign icon shown as pressed, and the Business name is converted into the Technical name by using the conversion file and other conversion parameters. While the = sign icon is ON, the Technical name field is locked and cannot be edited. If the Business name = sign icon is pressed this time, the Technical name is converted into the Business name by using the conversion file and other conversion parameters. While the = sign icon is ON, the Business name field is locked and cannot be edited. During Reverse-Engineering, if coupling parameters is set to 'No', then all object names from the source (whether from a DB instance, XSD, DDL, Excel, JSON, etc...) are stored in the Business Name property. If coupling is set to either Business-to-Technical, or Technical-to-Business, the result of the Reverse-Engineering is the same. In both cases, the object names from the source are stored in the Technical Name property and converted to Business Name using the conversion parameter. That's intuitively obvious when the coupling parameter is set to Technical-to-Business. The only safe method we can ensure is one by which the Technical Name come from the source is preserved, no matter the conversion parameters. Say we have a source object called cust_acct and the Technical-to-Business is set in such a way that the Business Name becomes Cust Acct. If the application applies Business-to-Technical conversion that would be set for example to camelCase, the Technical Name would be changed to custAcct, thereby losing the original cust_acct in the source. We prefer to let the user choose the expected outcome to either keep it as is, or to change the parameters and apply these changes to the model. 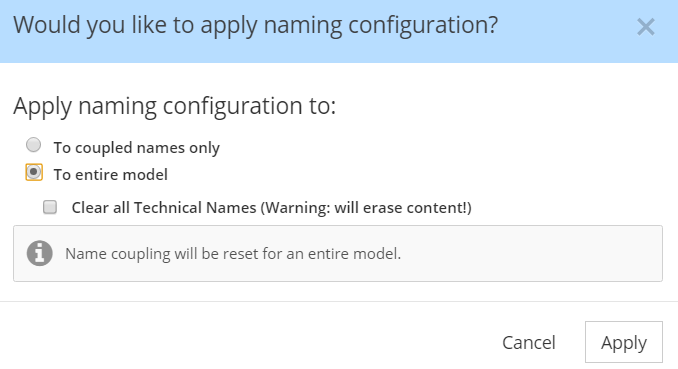 you may choose to check the box "Clear all Technical Names". Be careful of course. You may want to save a version of your model prior to applying this clearing, and test that the behavior matches your expectations. Going through "Customer Account", first we convert the word with the conversion file to "cust acct", then with the Invalid characters config, we remove the blank and get "custacct", but we've lost the word separator, therefore camelCase does not see the "acct" as a separate mode. The end result is: "custacct". the sequence becomes "cust acct" then "cust_acct", then "custAcct" which is the expected behavior.